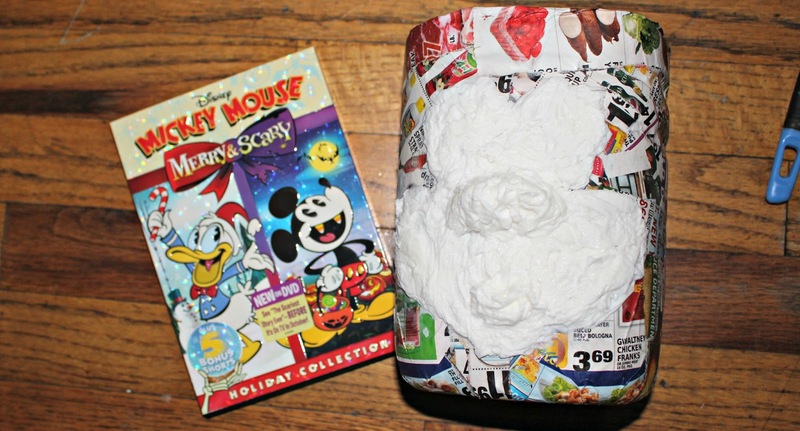 DIY Trick or Treat Bucket and a Mickey Mouse: Merry & Scary DVD #Giveaway! We were provided with a DVD and compensation in exchange for this post. All reviews and projects are our own. Halloween is my FAVORITE Time of year! Not Only do I love seeing the different costumes that come out each year, but also the different Trick Or Treat Bags that the stores sell or People make. If you didn't know, We LOVE Mickey and everything Disney... So when we got the chance to check out the new Mickey Mouse: Merry & Scary DVD, I knew it'd be a family affair! 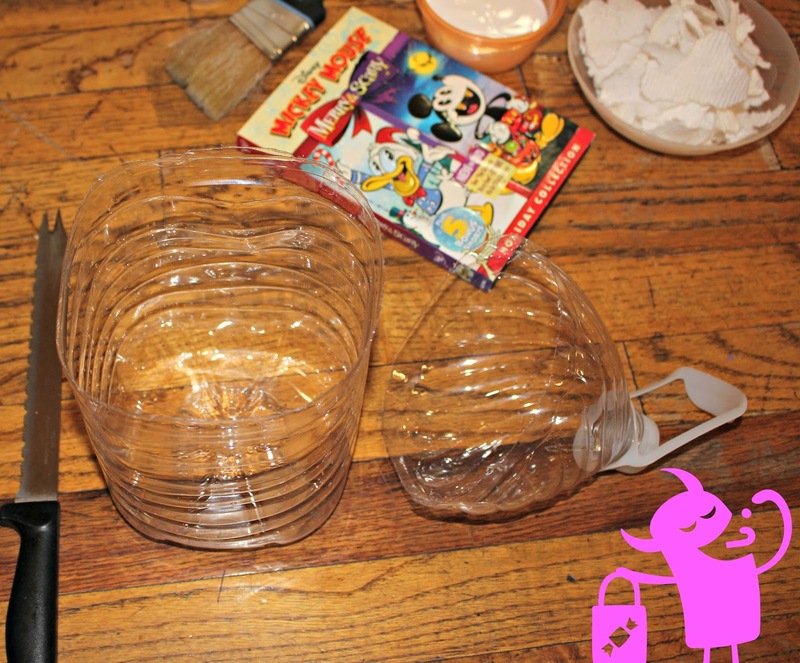 It also had my crafty gears turning and I decided to Make a DIY Trick Or Treat Bucket. It's Easy, Fun and You'll be the coolest parent in town! 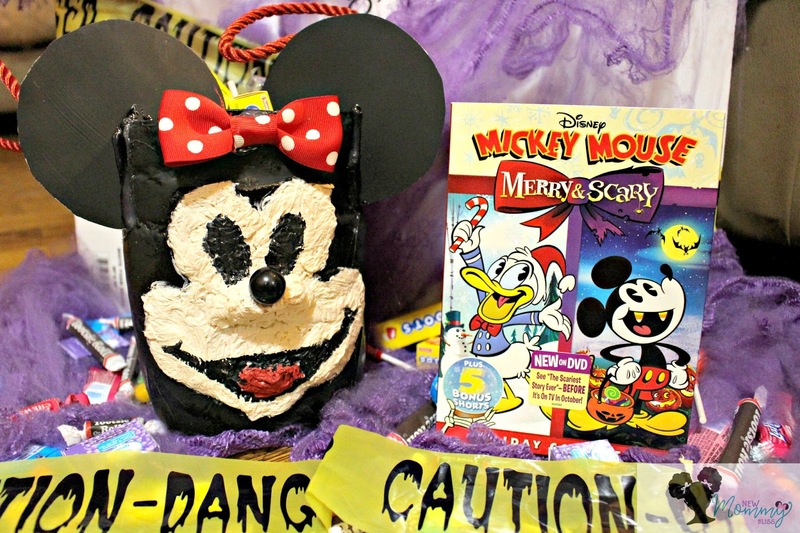 In, The Scariest Story Ever: A Mickey Mouse Halloween Spooktacular!, during Halloween, Mickey has tricked out his house like a “tomb, sweet, tomb" and along with his pals Donald and Goofy, plans to tell hair-raising Halloween stories! However, his attempt at being scary falls flatter than a pancake. Can Mickey conjure up a truly terrifying tale before the stroke of midnight? Also, in Duck The Halls: A Mickey Mouse Christmas Special, it’s the most wonderful time of the year…to migrate south for the winter! But Donald wants to stay put and celebrate his first Christmas with his friends. Mickey creates the ultimate list of everything to make Donald's first Christmas great, but before you can catch a snowflake on your tongue, Donald has turned into a shivering, sneezing duck-cicle! Step 1) Clean out your bottle and Dry it. Parents, Use the serrated knife and cut a half inch below where the shoulder of the bottle starts. 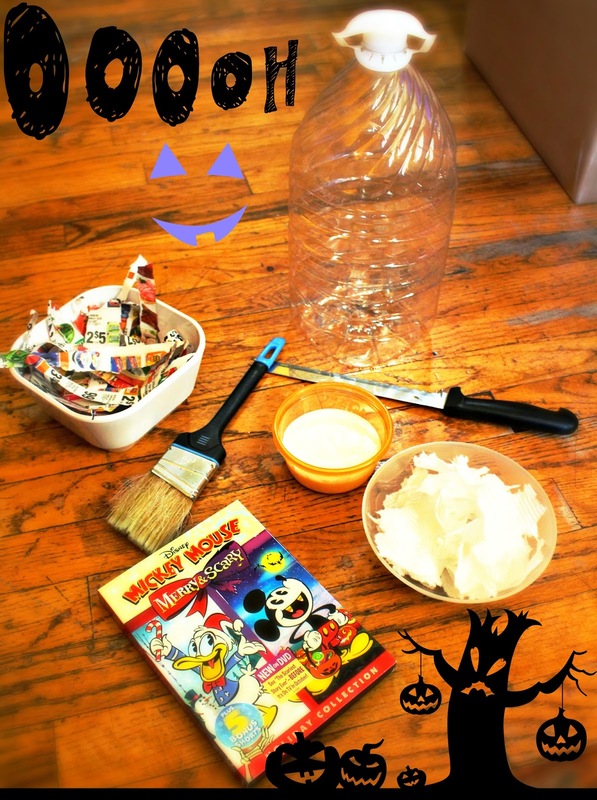 Step 2) Start off doing a paper mache type of creation and just cover the entire Bottle with Glue and Newspaper strips. (I forgot to get a paper so I used Supermarket flyers) I found it easy to cover two sides in glue, then strips, then Brush glue over the papers and fill in with more paper to make it thicker. Let Dry. Step 3) After Drying, Create an outline of the parts that you want to pop out such as a face or a bat, etc. Pour glue into the bowl with your shredded tissue and mix in a bowl with your hands. Now Take some and put inside your outline. Spread it out with your fingers to smoothen it out. In our Case, we are creating Mickey Mouse so we smoothened it over all the areas and shaped it like the non-black areas of his head. I added a bit more to the Nose Part and tongue to make it pop out even more. Step 5) PARENTS: Grab a pointy knife, put the tip over the fire and use it the poke 1 hole, 1.5 inches below the top. Repeat on opposite side. If you want a double hoop to hold, then add an extra hole 3 inches parallel to the first. Basically, You'll have two opposite sides with holes, 2 without. Now you're all done! 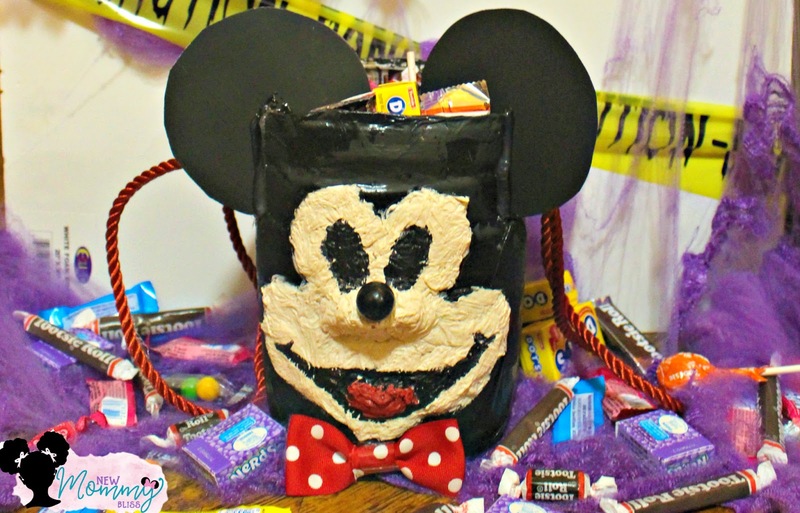 Your kid will be the coolest in the bunch with their super cool, reusable, DIY Trick or Treat Bucket! 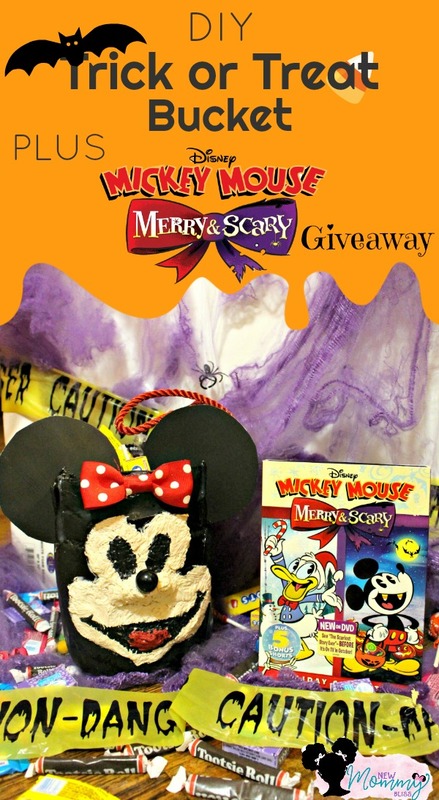 (1) Winner will receive a copy of Mickey Mouse: Merry & Scary! * Comment below and tell us What will You be for Halloween? Find and comment/Share on relevant Social Media Posts. This is fantastic! I usually go as a witch, but I have an excellent Minnie Mouse dress I should wear. I want to be a witch for Halloween! I haven't decided on what I will be for Halloween yet. I want to be Alice in Wonderland. I will be a pirate for Halloween! this year i am going to be a witch for halloween. I might be Wonder Woman for halloween! I'm planning on being Morticia for Halloween this year. I'm going to be gumby. I subscribed on youtube. Thanks for the giveaway. I really want to win this. I don't dress up for Halloween, but our children do for trick or treating. Nothing, but I am taking 3 scarecrows trick or treating. I liked and follow all. i will not be anything for Halloween, I will be working. I'm going to be one of the Trolls and take my niece out. I'm going to be a witch. I am going to be a Zombie for Halloween! I am going to match my Daughter this year and be Minnie Mouse :) Thanks for the chance!!! Following on all already! :) Ohhh I've been begging my guy to do Shrek and Fiona with me! lol Maybe he finally will this year! I've got to find or make the ears! Love this craft! The kids are dressing up as Nascar drivers and we are the sportscasters.